Johannes Kepler spent years of exhaustive study distilling volumes of data collected by his mentor, Tycho Brahe, into three simple laws that describe the motion of planets. Every planet moves in an elliptical orbit, with the Sun at one focus. As a planet moves in its orbit, a line drawn from the Sun to the planet sweeps out equal areas in equal time intervals. If T is the period and a is the length of the semimajor axis of a planet’s orbit, then the ratio T2/a3 is the same for all planets orbiting the same star. Consider a mass, m1, close to the surface of Earth. We will use Newton’s Law of Gravitation and Newton’s Second Law to show that the gravitational acceleration of m1 is independent of the mass of the object, as shown below. The forces F1-on-2 and F2-on-1 act along the line that joins the bodies and form an action/reaction pair. 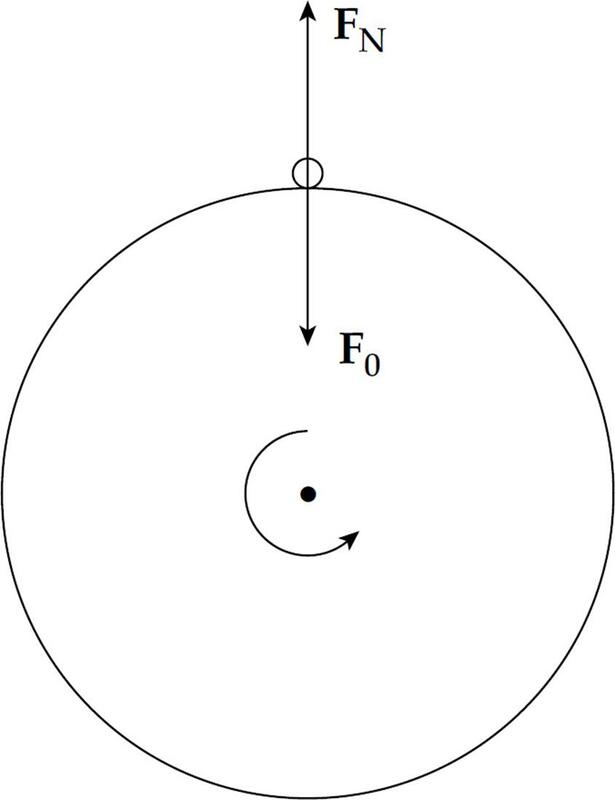 which is Kepler’s Third Law for a circular orbit of radius R.
We have been using the acceleration due to gravity g = 10 m/s2 for all objects falling near the surface of Earth. We have assumed that the mass does not affect the acceleration of gravity and now we will show why. Assume a small mass m is located near a large body (i.e., a planet or star) of mass M. The gravitational force on the object near the surface will equal the mass of the object times the acceleration of gravity ag. The equation below shows how the mass of the object cancels out, and the acceleration of gravity is independent of that mass of the object. From this expression we can see that the acceleration due to gravity for any object on a planet would be related to the mass and radius of the planet, but not the mass of the object. Newton’s Law of Gravitation is really a statement about the force between two point particles: objects that are very small in comparison to the distance between them. Newton also proved that a uniform sphere attracts another body as if all of the sphere’s mass were concentrated at its center. For this reason, we can apply Newton’s Law of Gravitation to extended bodies, that is, to objects that are not small relative to the distance between them. Additionally, a uniform shell of mass does not exert a gravitational force on a particle inside it. This means that if a spherical planet is uniform, then as we descend into it, only the mass of the sphere underneath us exerts a gravitational force; the shell above exerts no force because we’re inside it. Example 2 Given that the radius of Earth is 6.37 × 106 m, determine the mass of Earth. 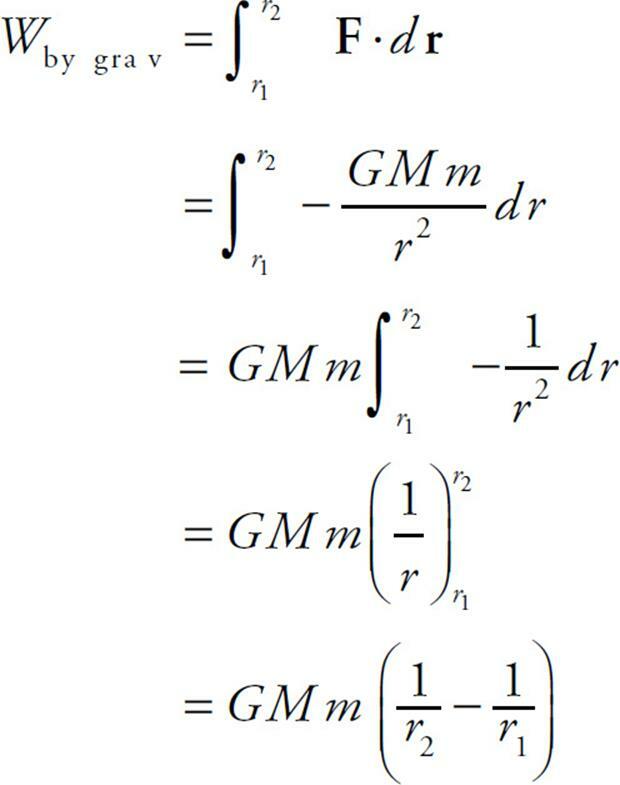 Example 3 We can derive the expression GM/R2 by equating mg and GMm/R2 (as we did in the previous example), and this gives the magnitude of the absolute gravitational acceleration, a quantity that’s sometimes denoted g0. 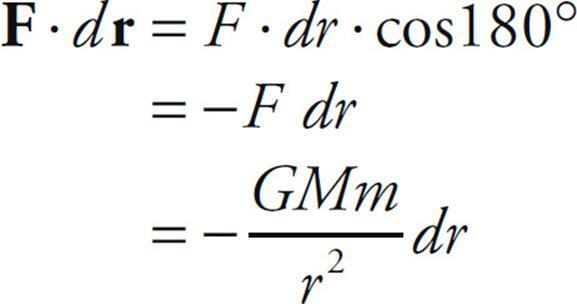 The notation g is acceleration, but with the spinning of Earth taken into account. Show that if an object is at the equator, its measured weight (the weight that a scale would measure), mg, is less than its true weight, mg0, and compute the weight difference for a person of mass m = 60 kg. Solution. Imagine looking down at Earth from above the North Pole. regardless of the mass of the satellite (well, as long as m < < M). Solution. Since the bar is an extended body (and not spherically symmetric), we must calculate F using an integral. Select an arbitrary segment of length dx and mass dM in the bar, at a distance x from its left-hand end. When we developed the equation U = mgh for the gravitational potential energy of an object of mass m at height h above the surface of Earth, we took the surface of Earth to be our U = 0 reference level and assumed that the height, h, was small compared to Earth’s radius. 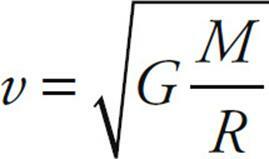 In that case, the variation in g was negligible, so g was treated as constant. 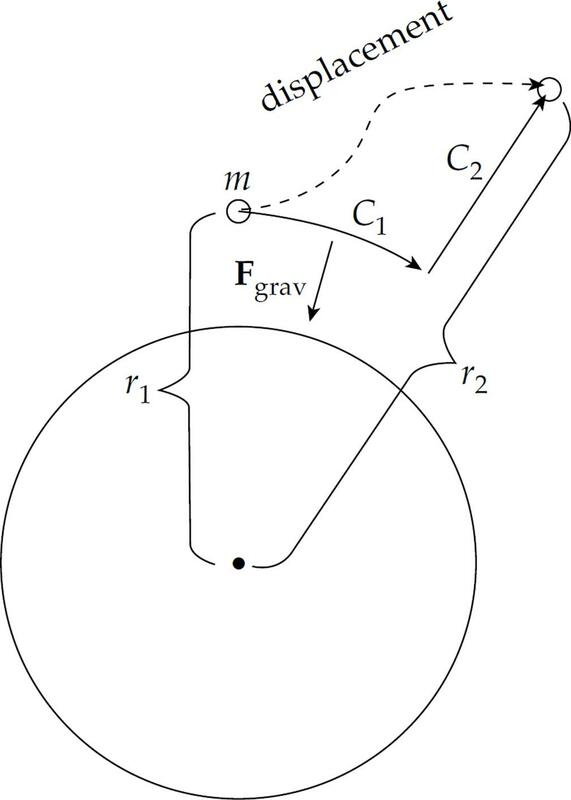 The work done by gravity as an object was raised to height h was then simply –Fgrav × s = –mgh, so Ugrav, which by definition equals –Wby grav, was mgh. 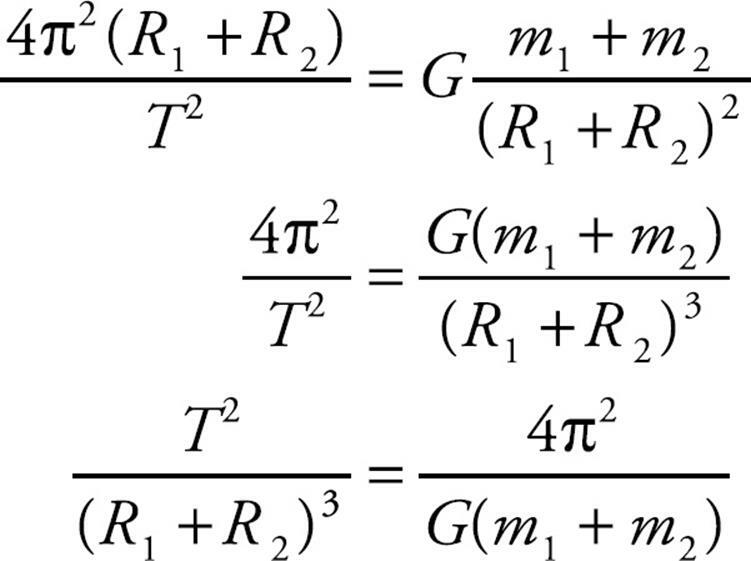 But now we’ll take variations in g into account and develop a general equation for gravitational potential energy, one that isn’t restricted to small altitude changes. Notice that, according to this equation (and our choice of U = 0 when r = ∞), the gravitational potential energy is always negative. This just means that energy has to be added to bring an object (mass m) bound to the gravitational field of M to a point very far from M, at which U = 0. 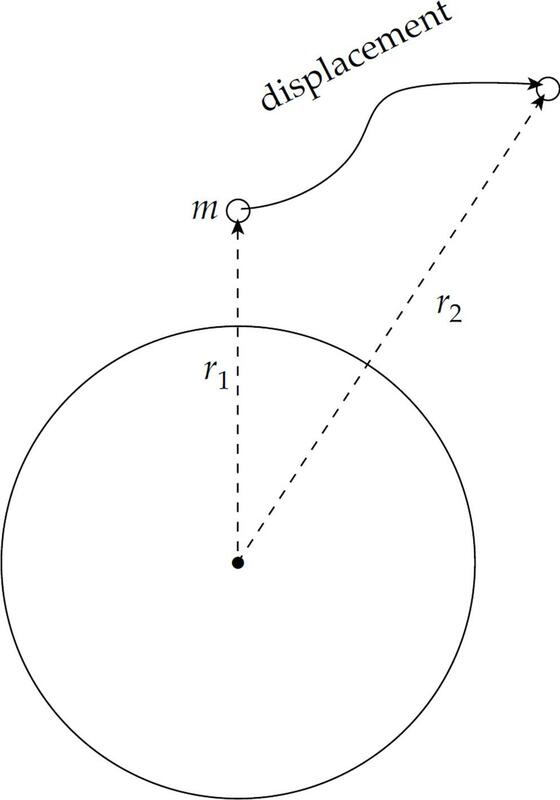 Example 7 A satellite of mass m is in a circular orbit of radius R around Earth (radius rE, mass M). (a) What is its total mechanical energy (where Ugrav is considered zero as R approaches infinity)? (b) How much work would be required to move the satellite into a new orbit, with radius 2R? 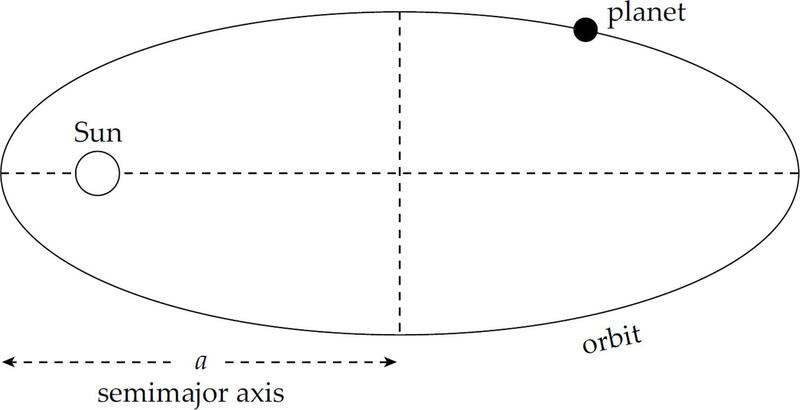 Example 8 An asteroid of mass m is in an elliptical orbit around the Sun (mass M). Assume that m << M.
(a) What is the total energy of the asteroid? (b) What is the ratio of v1 (the asteroid’s speed at aphelion) to v2 (the asteroid’s speed at perihelion)? Write your answer in terms of r1 and r2. (c) What is the time necessary for the asteroid to make a complete orbit around the Sun? This tells us that the asteroid’s speed at aphelion is less than its speed at perihelion (because r2/r1 < 1), as implied by Kepler’s Second Law (a line drawn from the Sun to the asteroid must sweep out equal areas in equal time intervals). The closer the asteroid is to the Sun, the faster it has to travel to make this true. Kepler’s First Law states that the planets’ orbits are ellipses, but the ellipses that the planets in our solar system travel are nearly circular. The deviation of an ellipse from a perfect circle is measured by a parameter called its eccentricity. The eccentricity, e, is the ratio of c (the distance between the center and either focus) to a, the length of the semimajor axis. For every point on the ellipse, the sum of the distances to the foci (plural of focus) is a constant (and is equal to 2a in the figure below). 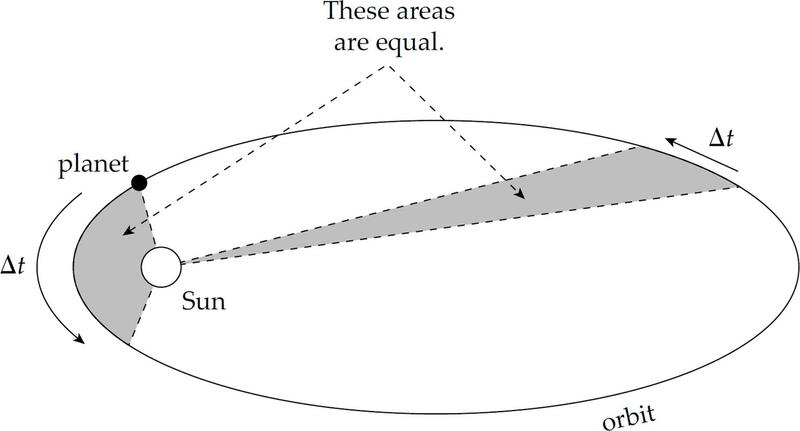 Kepler’s First Law also states that one of the foci of a planet’s elliptical orbit is located at the position of the Sun. Actually, the focus is at the center of mass of the Sun-planet system, because when one body orbits another, both bodies orbit around their center of mass, a point called thebarycenter. So the center of mass of the Sun-Earth system is only 450 km from the center of the Sun, a distance of less than 0.1% of the Sun’s radius. Example 9 Derive a corrected version of Kepler’s Third Law for the following orbiting system. 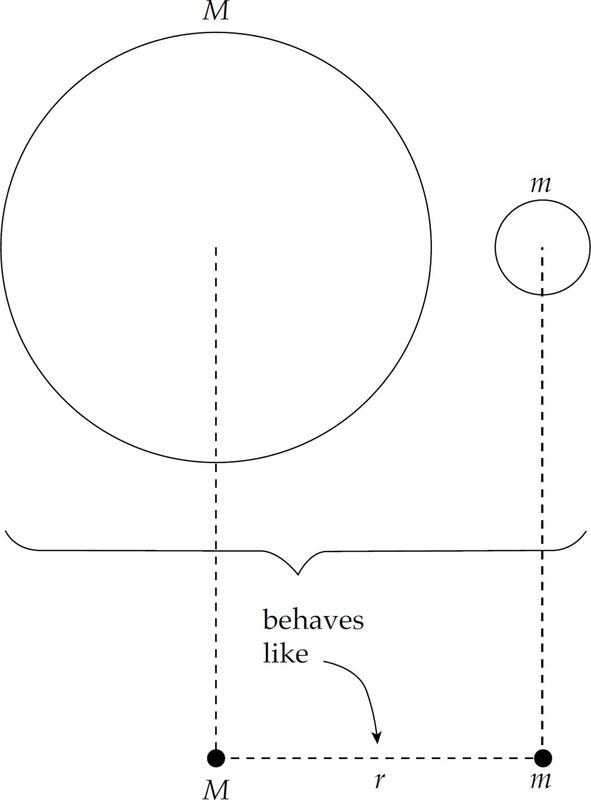 Both bodies have orbit period T.
Note that this final equation is a general version of Kepler’s Third Law for a circular orbit derived earlier, T2/R3 = 4π2/GM, where it was assumed that the planet orbited at a distance R from the center of the Sun. Example 10 An artificial satellite of mass m travels at a constant speed in a circular orbit of radius R around Earth (mass M). What is the speed of the satellite? Notice that the satellite’s speed doesn’t depend on its mass; even if it were a baseball, if its orbit radius were R, then its orbit speed would still be . The answers and explanations can be found in Chapter 16. 3. A moon of mass m orbits a planet of mass 100m. Let the strength of the gravitational force exerted by the planet on the moon be denoted by F1, and let the strength of the gravitational force exerted by the moon on the planet be F2. Which of the following is true? 4. The dwarf planet Pluto has 1/500 the mass and 1/15 the radius of Earth. What is the value of g (in m/s2) on the surface of Pluto? 5. A satellite is currently orbiting Earth in a circular orbit of radius R; its kinetic energy is K1. If the satellite is moved and enters a new circular orbit of radius 2R, what will be its kinetic energy? 6. 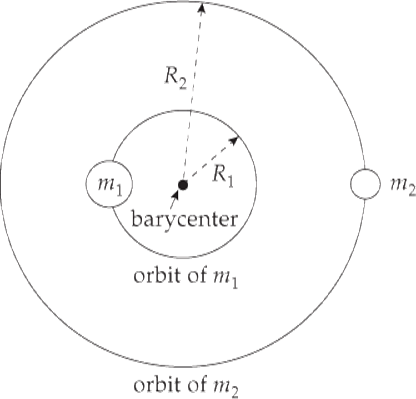 A moon of Jupiter has a nearly circular orbit of radius R and an orbit period of T. Which of the following expressions gives the mass of Jupiter? 8. The mean distance from Saturn to the Sun is 9 times greater than the mean distance from Earth to the Sun. How long is a Saturn year? 10. 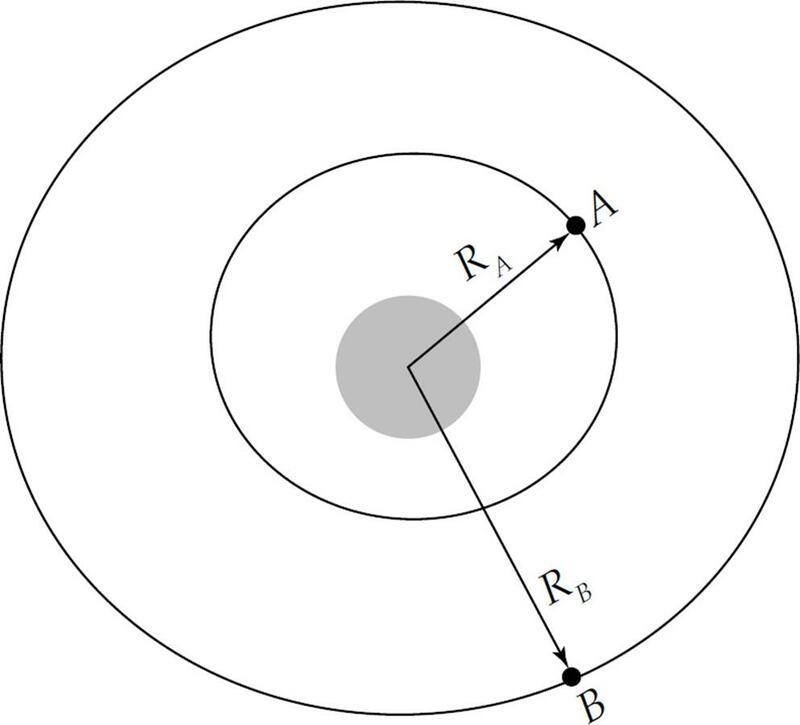 Two satellites, A and B, orbit a planet in circular orbits having radii RA and RB, respectively, as shown above. If RB = 3RA, the velocities vA and vB of the two satellites are related by which of the following? 1. Consider two uniform spherical bodies in deep space. Sphere 1 has mass m1 and Sphere 2 has mass m2. Starting from rest from a distance R apart, they are gravitationally attracted to each other. (a) Compute the acceleration of Sphere 1 when the spheres are a distance R/2 apart. (b) Compute the acceleration of Sphere 2 when the spheres are a distance R/2 apart. (c) Compute the speed of Sphere 1 when the spheres are a distance R/2 apart. (d) Compute the speed of Sphere 2 when the spheres are a distance R/2 apart. 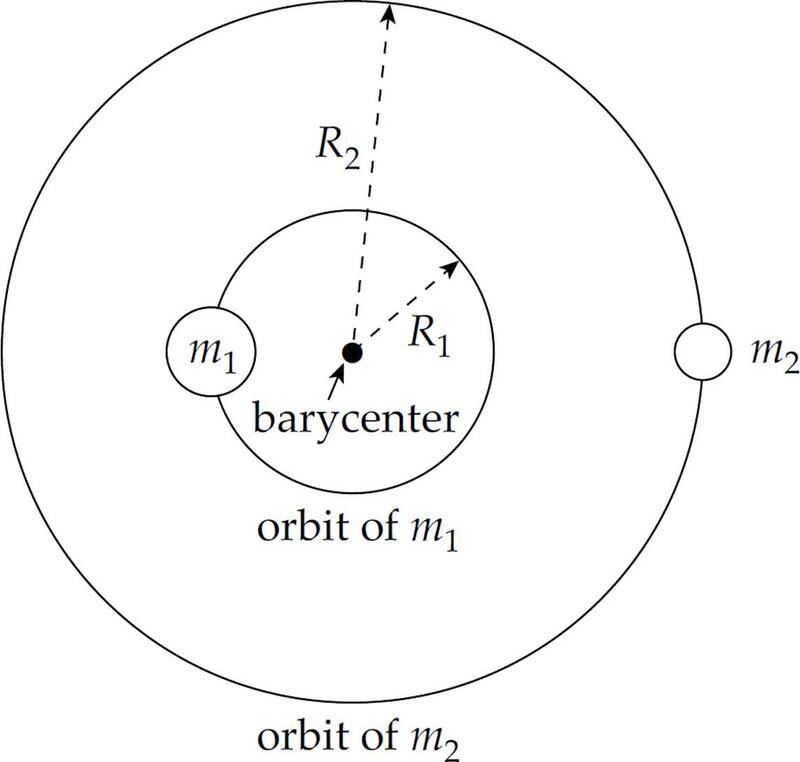 Now assume that these spheres orbit their center of mass with the same orbit period, T.
(e) Determine the radii of their orbits. Write your answer in terms of m1, m2, T, and fundamental constants. 2. A satellite of mass m is in the elliptical orbit shown below around Earth (radius rE, mass M). Assume that m << M.
(a) Determine v1, the speed of the satellite at perigee (the point of the orbit closest to Earth). Write your answer in terms of r1, r2, M, and G.
(b) Determine v2, the speed of the satellite at apogee (the point of the orbit farthest from Earth). 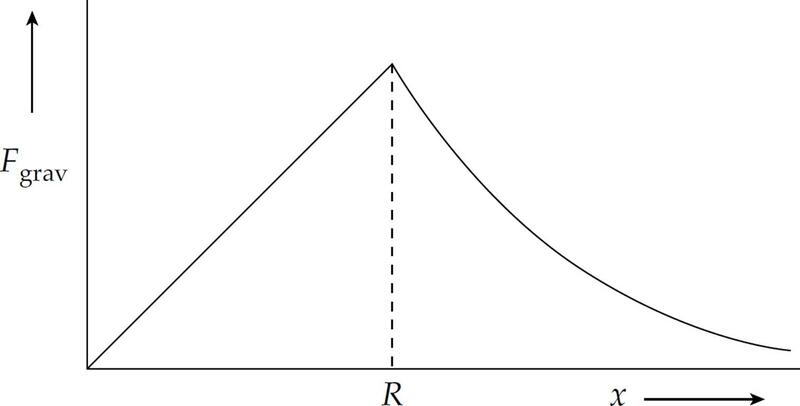 Write your answer in terms of r1, r2, M, and G.
(c) Express the ratio v1/v2 in simplest terms. (d) What is the satellite’s angular momentum (with respect to Earth’s center) when it’s at apogee? (e) Determine the speed of the satellite when it’s at the point marked X in the figure. (f) Determine the period of the satellite’s orbit. Write your answer in terms of r1, r2, M, and fundamental constants. Newton’s Law of Gravitation gives the force between any two point masses, regardless of their mass or location. This uniform circular motion can also be described by an angular velocity and a centripetal acceleration. Both mechanical energy and angular momentum are conserved for orbits. Systems are bound when the total mechanical energy is less than zero. 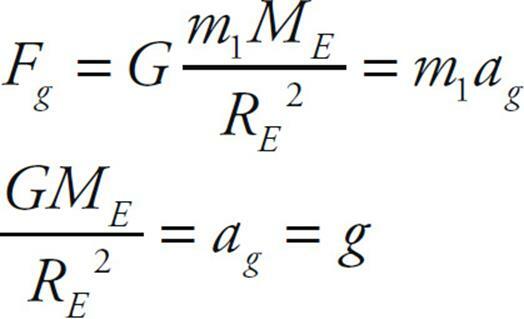 This means that the gravitational potential energy is greater than the kinetic energy of the system. For an object to escape, its kinetic energy must be greater than or equal to its gravitational potential energy. for M1 to escape the pull of M2. 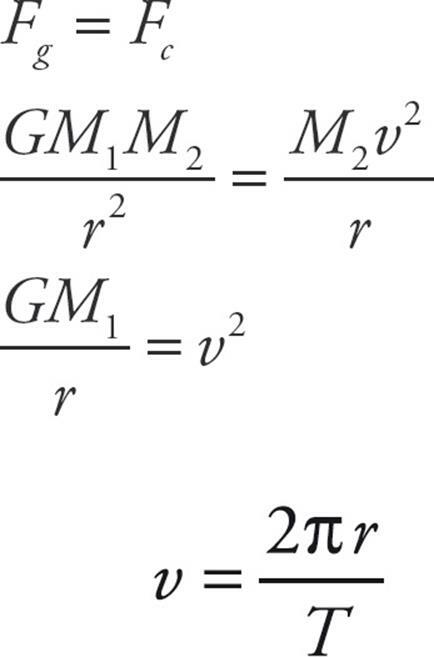 The gravity due to a spherical shell of mass, M, and radius, R, where the mass is at a distance, r, away from the center of the shell is represented by the equations below. 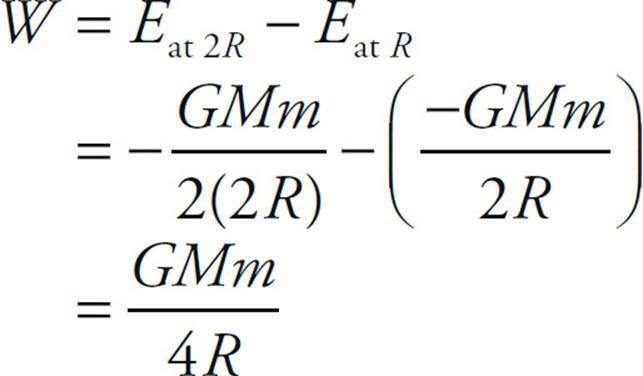 The gravity due to a uniform, solid sphere where a small mass, m, is at a distance, r, away from the center of the sphere is represented by the equations below.